Iron has been used by man for centuries as a building material. It is one of the most plentiful metals found on the earth. Iron artifacts recovered by divers include portholes, knives, flintlock pistols, running light frames, and a wide array of other interesting items. However, when left in a saltwater environment for long periods of time iron is vulnerable to oxidation, where acids and chlorides create an electrical charge that corrodes the metal compound. In older artifacts, oxidation has caused a level of marine biological growth to encapsulate the object. This growth, called a concretion creates a highly acidic layer on the artifact that greatly increases corrosion. Iron artifacts removed from sea water should be immediately placed in a fresh water solution. If allowed to dry, the concretions surrounding the object become very hard and cling to the artifact with much more intensity. Regular tap water works for storage, but rain water and distilled water have a higher ph level that allows them to inhibit corrosion much more efficiently. Removal of the concretion level depends upon the size and general condition of the metal. For large amounts of concretion, a hammer blow can generally remove most of the outer layer. For smaller and more brittle objects, a dental pick, or brush can be used. Remember to always keep the artifact wet when removing concretions. Laboratories use a technique called glass bead blasting to rid artifacts of the concretion layer. This is similar to sandblasting but the soft glass beads are far less abrasive than sand. The normal intensity of blasting ranges from 25 to 80 pounds while being mindful of keeping the nozzle at least 6 to 10 inches from the item. Each artifact should be carefully examined before this process and with more brittle objects, air pressure should be decreased. 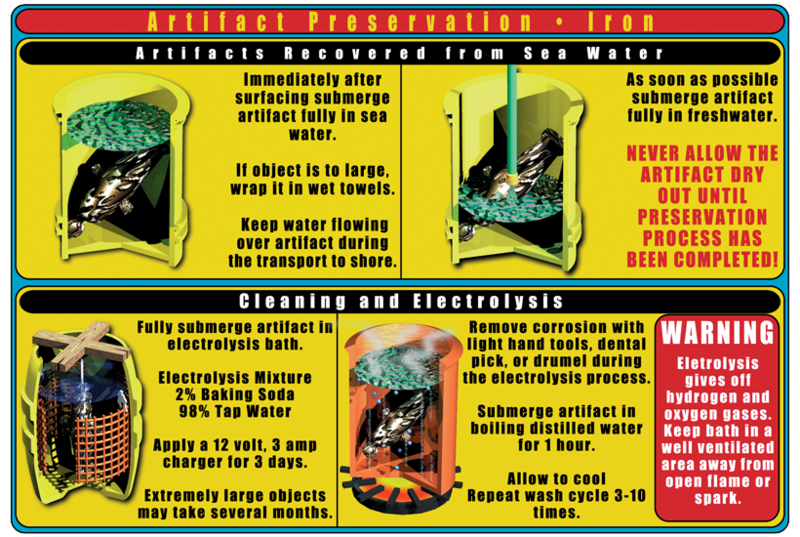 The most effective method for restoring iron artifacts is electrolytic reduction. This process reduces concretions to a more stable form where they can be removed with less stress on the metal. The artifact is completely submerged in tap water with a 2% solution of sodium carbonate (baking soda). It is then subjected to 3 amps of electricity for two to three days. It is recommended that this be done under laboratory conditions but electrolytic reduction is fairly easy to set up on your own. A water tank must be on hand that can completely cover the artifact when filled. Then the appropriate amount of sodium carbonate must be added (measure weight to volume). Two steel anodes are placed inside the tank next to the artifact. It is important not to let the anodes touch the artifact, as this will cause a short. 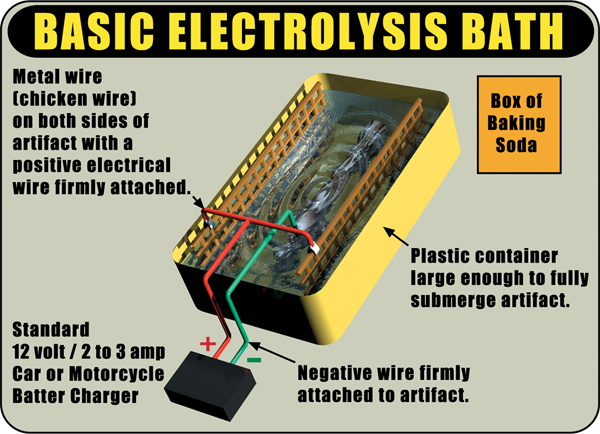 The anodes should be connected to the positive terminal of your power source. The negative terminal is attached to the artifact. The power source should be placed on 6 volts and, in a short while, should start producing bubbles of hydrogen. The artifact can be manually cleaned and picked during this procedure, but special care needs to be taken. Only soft, sensitive brushes should be used when cleaning an artifact after the concretions have been removed. It is important to have adequate ventilation when using electrolytic reduction as potentially explosive hydrogen gas is given off during the process. Once all concretions are removed, the artifact should be placed in boiling, distilled water for an hour to provide deep cleaning. After boiling, allow the water to cool and replace it with fresh distilled water. Repeat the cycle three to four times. Larger artifacts may require more boiling cycles. Once the boiling cycle is complete the object should be rinsed and soaked in distilled water. The artifact is now ready to dry. For complete dehydration you can preheat an oven to 350 degrees Fahrenheit and allow the artifact to sit in the heat for 24 to 48 hours. Dehydration times vary according to the surface texture of the item. As a general rule, the rougher the surface of the artifact, the longer it will take to dehydrate. Once fully dehydrated, Tannic acid can be applied to the exterior of the artifact. This solution inhibits corrosion and restores a more aesthetically pleasing black color to the object. Dip or brush the artifact in the tannic acid solution for up to four coats. Be sure to wear waterproof gloves when carrying out this step, if not the tannic acid will stain your skin black. The final step is to provide a protect ant from moisture using conservation wax. Dip the artifact in melted wax for approximately 30 seconds, and then allow drying. The wax not only keeps moisture out but also provides a self-sealing layer that prevents scratches.